23 Librae is a yellow-orange main sequence dwarf star of spectral and luminosity type G4-5 V. It has about 1.05 to 1.10 times the mass of Sol (Holmberg et al, 2007; Takeda et al, 2007a; and Yoichi Takeda, 2007b), 1.25 times its diameter (van Belle and von Braun, 2009, page 16 for HD 134987), and 1.5 times its theoretical bolometric luminosity (NASA Star and Exoplanet Database, based on Kenneth R. Lang, 1980). The star is 1.6 to 1.9 times more enriched than Sol with elements heavier than hydrogen ("metallicity"), based on its abundance of iron (Holmberg et al, 2007; Takeda et al, 2007a; and HD 134987 at exoplanets.org). 23 Librae is older than Sol, at close to 8.1 to 11.1 billion years ((Holmberg et al, 2007; Takeda et al, 2007a; and Saffe et al, 2008). Useful catalogue numbers and designations for the star include: 23 Lib, HR 5657, Gl 579.4, Hip 74500, HD 134987, CD-24 11928, CP-24 5475, SAO 18327, and LTT 6066. In 1999, a team of astronomers (Steven S. Vogt, Geoffrey W. Marcy, R. Paul Butler, and Kevin Apps) announced the discovery of a Jupiter-class planet around 23 Librae using radial-velocity analysis (Vogt et al, 2000). 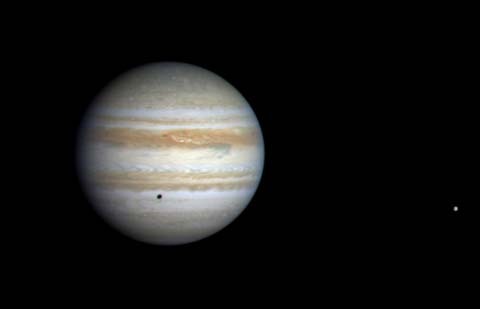 Planet b has at least 1.59 times Jupiter's mass. It moves around 23 Librae at an average distance of only 0.81 AUs -- between the orbital distances of Venus and Earth in the Solar System -- in an elliptical orbit (e=0.23) (Jones et al, 2009; see also the web page for HD 134987 at exoplanets.org). This orbit would take almost three-quarters of a year (258 days) to complete. While subsequent astrometric analysis, however, suggested that planet b may have as much as 34 times the mass of Jupiter with an inclination of 2.7° from Earth's line of sight, this appears to have been refuted with further radial-velocity analysis (Jones et al, 2009; and Han et al, 2000). Planetary candidates "b" and "c"
On December 14, 2009, a team of astronomers (Hugh R. A. Jones, R. Paul Butler, C. G. Tinney, Simon O’Toole, Robert A. Wittenmyer, Gregory W. Henry, Stefano Meschiari, Steven S. Vogt; Eugenio J. Rivera, Gregory Laughlin, Brad D. Carter, Jeremy Bailey, and James S. Jenkins) announced the discovery of another Jupiter-like planet "c" of at least 0.82 Jupiter-mass) in a orbit around 23 Librae with a period of 14 years (AAO press release; and Jones et al, 2009). Planet c's orbit takes around 5,000 days to complete at a semi-axis of 5.8 AUs and is relatively circular (e~0.12). 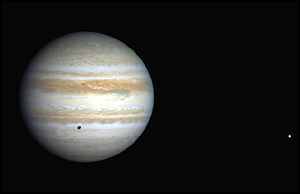 Its orbit and mass are close to the prototypical Jupiter in the Solar System. The following table includes all star systems known to be located within 10 light-years (ly), plus more bright stars within 10 to 20 ly, of 23 Librae. Try Professor Jim Kaler's Stars site for other information about 23 Librae at the University of Illinois' Department of Astronomy. John Whatmough developed illustrated web pages on this system in Extrasolar Visions. Up-to-date technical summaries on these stars can be found at: Jean Schneiders's Extrasolar Planets Encyclopaedia; the Astronomiches Rechen-Institut at Heidelberg's ARICNS; and the NASA Star and Exoplanet Database. Additional information may be available at Roger Wilcox's Internet Stellar Database. The ancient Greeks grouped the stars of Libra with Constellation Scorpius, the Scorpion. 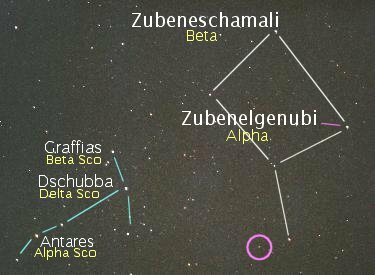 To the later Romans, however, Constellation Libra represent "the Scales of Justice" held by Julius Caesar. For later peoples, these scales became associated with Virgo as the Goddess of Justice, proving that political power is indeed fleeting. . For more information about the stars and objects in this constellation, go to Christine Kronberg's Libra. For an illustration, see David Haworth's Libra.